May is national salad month. There is nothing like fresh, tender baby greens this time of year and we have some ready for picking!! We’ll start our week on Meatless Monday, with a Mexican-style salad packed with greens, avocados, corn and other great eats! 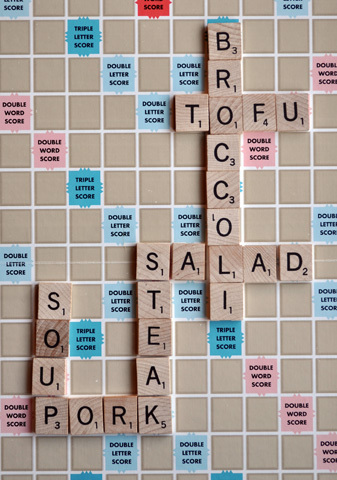 With our new speller, and our wanna-be speller, Scrabble has become a popular game around here. The kids helped me spell out our menu for the week. As we prepare for the coming week, a special tribute goes out to all the moms. I share with you a photo of an early Mother’s Day surprise. 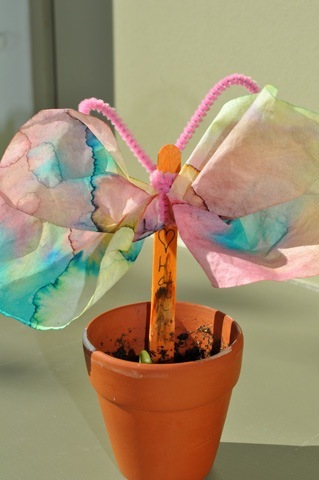 Each morning, with animated excitement, Skoogie helps me water the plant and the sunflower is beginning to poke through the dirt. Special thoughts, love and appreciation to all the moms who nourish, care for and sprout your beans!!!! 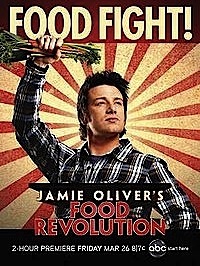 We can’t get enough of Jamie Oliver, and are trying more of his tasty, quick-to-prepare meals. We'll also celebrate Cinco de Mayo on Thursday with some of our favorite tacos de carnitas. This week, we're going to try re-visiting some recipes that we missed while I was laid up on the couch. 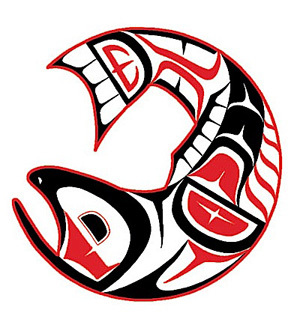 At the end of the week, we'll enjoy some delicious sockeye salmon. We’re big fans of Top Chef and are dedicating most of the week to “kid friendly” recipes that chefs have made on the show. Wednesday night is the season finale and we’ll be enjoying a meal from one of our favorite contestants this season, Richard Blais. We’re trying to keep meals simple again this week while healing continues. 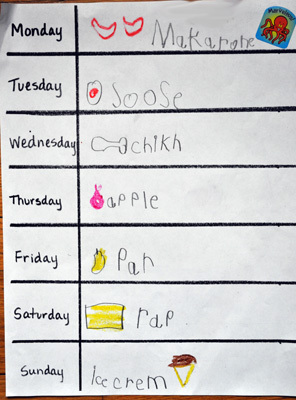 Last week a menu that O created for a class assignment inspired our weekly menu. It was a HUGE SUCCESS. This week Skoogie has requested several recipes from “my cookbook”— C is for Cooking. Today is Monday ….. Last month, O’s class read the Eric Carle classic and then each student created their own version of the song. We’re using it for inspiration as we create this week’s menu. We’ve done it before, but this time it is O’s very own menu with melt your heart kindergarten phonetic spelling! This week we’ll be making simple meals as my ankle heals from a “silly” fall. I was trying to do too much at once! I was supposed to be on my way to an appointment with Skoogie. But on the way out, I decided to carry down blankets and a comforter that needed washing after a week of “sick germs” in our house. Unfortunately, I missed the last step. At least there was a sense of relief when the friend that came to my rescue found a piece of the stair broken off-- much better then thinking the crack I heard was my ankle!! !